Please note, while prices and inclusions are accurate at time of loading they are subject to change due to changes in cruise line policies and pricing and due to currency fluctuations. Currency surcharges may apply. Please check details of price and inclusions at time of booking. Special is valid from 18th March 2019 to 30th April 2019. *Conditions Apply: Prices are per person, capacity controlled and listed in Australian dollars twin share including port taxes. Prices may fluctuate if surcharges, fees, taxes or currency change, and may be withdrawn at any time. Prices shown here are not shown in real time. While we endeavour to keep our pricing as up-to-date as possible, the advertised prices shown here may differ from the live prices in our booking system. The prices shown are for a cash payment. Credit card fees of up to 2.5% will apply. Offer correct as at 18Mar19 and subject to live availability at time of booking. Prices are per person twin share based on best available cruise fare, inclusive of all discounts unless otherwise stated. All offers are capacity controlled and can be withdrawn or modified at any time without notice and subject to availability at time of booking. Outside and Balcony cabins may have obstructed views and Suite cabins comprises Junior Suites, Mini Suites and any other type of suite that represents the best value for each cruise. Unless otherwise stated, all packages containing airfare will require full airfare and taxes within 24 hours of reservation and cancellation/amendment conditions apply. Air taxes are included in package price and are subject to change depending on departure city. Onboard gratuities are included and may not be removed from pricing. Cabins are based on guarantee and cabin number will not be assigned until documentation or embarkation. +Hotels in certain cities must charge local government tax directly to guests upon checkout which cannot be collected in advance by our agency. All passports, vaccinations and visas are the responsibility of the travelling guest to secure prior to departure from Australia. Some cruise lines reserve the right to impose a fuel levy if the NMEX price reaches a certain level - please check with your consultant at time of booking. Cruise deposit, amendment and cancellation conditions apply. Travel agent service fees not included. Special conditions apply - please ask for full details at time of enquiry. Offer ends 30Apr19 or until sold out/withdrawn from sale. Please note only residents with an Australian address are eligible to book Australian rates in Australian dollars. This cruise package is provided by Seven Oceans Cruising, please ask your travel agent to contact us for more information. 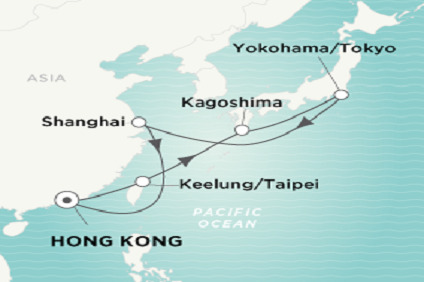 15 Night cruise sailing roundtrip from Hong Kong onboard Crystal Symphony. Visit Japan’s “friendliest city” of Kagoshima, presided over by active volcano Sakurajima; feel Tokyo’s pre-Olympic energy; and spend two nights immersed in Shanghai’s sparkling skyline, stellar shopping and Imperial history. Although Hong Kong has returned to its original Chinese roots, it still remains a cosmopolitan city with influences, languages and accents from around the world. Here East meets West and the result is electric. Soaring skyscrapers rise from the hills and harbor, blending geography and nature with commercial concrete, steel and pulsating neon in a way that brings traditional Chinese culture and Western-style commerce into perfect harmony. The bustling city streets are lined with teeming markets and sophisticated boutiques tucked tightly into any available crevice. Some of the world's best shopping is found in Central, located on Hong Kong Island and only a short ferry ride away. Discover the beauty and magic of Hong Kong today! Across the Formosa Straits from Mainland China lies the island of Taiwan, whose name means "Terraced Bay." Taipei lies just 20 miles from our pier in Keelung. It is Taiwan's largest city and stands on the island's northern tip, where the Tamsui and Keelung Rivers meet. Since becoming the capital of the Taiwanese Republic of China, its population has mushroomed to approximately three million people. That momentum continues today, making this cultural and economic center one of Asia's fastest growing cities. Taiwan is a land of contrasts, from its bustling urban areas to its serene countryside. Explore numerous sites of interest including 19th-century city gates and walls, the Chiang Kai-Shek Memorial Hall, the Sun Yat-sen Memorial and the famous Grand Hotel. Kagoshima lies cradled within the protective arms of a large inlet on the island of Kyūshū's extreme southern tip. It is Japan's southernmost city and combines slow-paced charm with thriving commercial activity. World-renowned Mount Sukurajima stands less than three miles away. This rare example of a busy metropolitan area coexisting with a volcano has led to comparisons between Kagoshima and the Italian city of Naples. Stroll picture-perfect Japanese gardens, explore an abundance of historical sites or shop for traditional pottery. Fusing the vitality of a modern metropolis with the stately elegance of yesteryear, Tokyo is truly unique. From the timeless beauty of the Meiji Shrine to the glittering Ginza district and impressive Tokyo Tower, this international giant is a complex blend of East and West. Houses of wood and paper stand beside towering steel skyscrapers, while kimono-clad women stroll beside teenagers who have created a fashion all their own. The timeless Imperial Palace bears testament to Japan's enduring traditions. Despite encroaching urban development, it continues to exist in a verdant parkland of isolation. Images of the vibrant metropolis of Tokyo, which is home to more than 11 million people, will create memories of a lifetime. Note: Arrival and departure times for this port will depend on tidal restrictions. Shanghai, located just inside the mouth of the great Yangtze River, marks the point where Asia's longest and most important river completes its 3,400-mile journey to the Pacific. The city's unique location is the source of its existence and has determined what it is today. Until 1842, Shanghai was merely a tiny fishing village. Following the first Opium War, Shanghai became a treaty port, which opened the city to foreign influence and resulted in the development of numerous British, French and American colonial settlements within the city and along the Yangtze River. Today, Shanghai is the center of China's economic resurgence and its skyline attests to this development in the form of towering skyscrapers, brightly lit commercial high-rises and the unsettling Oriental Pearl Tower. A testimony to Shanghai's colonial era, stately European buildings in art deco style line the Bund, the city's spacious waterfront promenade. An endless flotilla of sampans edge the Huangpu River, dividing old and new Shanghai. Beyond the rush of the city, serene ponds and gardens offer a gentle respite. Must-see sights include the Jade Buddha Temple and tranquil Yu Garden, impressive monuments to China's history and style. Inland lies Suzhou, with its majestic Grand Canal and classical gardens, as well as equally significant Hangzhou, terminus of the Grand Canal and the center of China's legendary tea industry. Itinerary may vary by sailing date and itineraries may be changed at the cruise lines discretion. Please check itinerary details at time of booking and before booking other travel services such as airline tickets. Unless otherwise expressly noted, all materials, including images, illustrations, designs, icons, and photographs appearing anywhere on this website are protected by worldwide copyright laws and treaty provisions. The copyright on such materials is held by the original creator of the materials. None of the materials may be copied, reproduced, displayed, modified, published, uploaded, posted, transmitted or distributed in whole or in part in any form or by any means other than as provided by Cruise Factory to its clients, or with the prior written permission of Cruise Factory. All rights not expressly granted in these Terms are reserved. Any unauthorised use of the materials appearing on this website may violate copyright, trademark and other applicable laws and could result in criminal or civil penalties. Information on this Web Site has been obtained from the Cruise Companies represented. However, the cruise industry is constantly changing and should be used as a guide only. We are unable to take responsibility for incorrect information and you must confirm all details at the time of booking. Please submit any data errors/omissions you may notice on this site.